Puppy Mama has now shared over 700 stories of dog parents around the world. These stories have warmed our hearts and are proving that dogs truly are amazing family members. We've been working hard crafting these incredible stories into a book series. To date, we've completed the manuscript of "Raising A Doodle", incorporating stories, photos, and tips and tricks from 60+ women around the world. Due to the large interest, we are rolling up our sleeves to begin writing book #2! We are accepting applications from all dog parents (of all breeds). Submit your stories, insights and/or photos today. 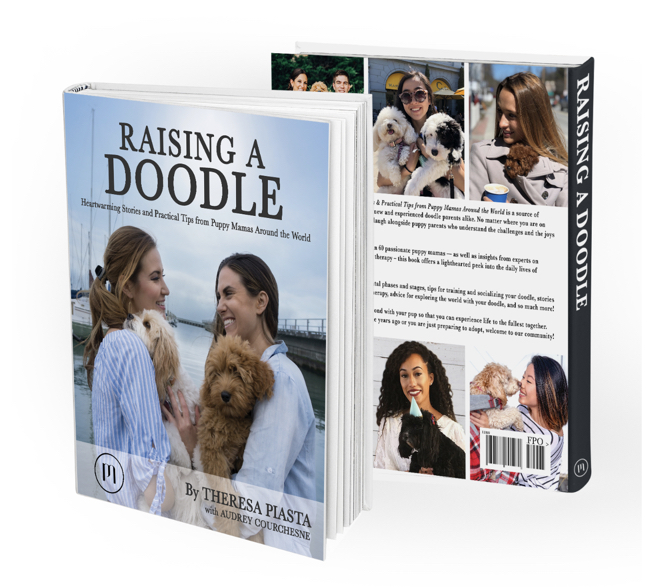 Raising a Doodle: Heartwarming Stories & Practical Tips from Puppy Mamas Around the World is a source of guidance, support, and inspiration for new and experienced doodle parents alike. No matter where you are on your journey with your pup, learn and laugh alongside puppy parents who understand the challenges and the joys of raising a doodle. With stories and photos from more than 60 passionate puppy mamas — as well as insights from experts on training, health, grooming, and canine therapy – this book offers a lighthearted peek into the daily lives of doodle parents and their pups. This book will help you to grow your bond with your pup so that you can experience life to the fullest together. Whether you brought your doodle home years ago or you are just preparing to adopt, welcome to our community!